I oversee the Archives Information Management and Reference Teams. We identify materials that should be kept in the Archives to document the Smithsonian's history, make sure that any researcher can find what they need in our holdings, and answer many diverse questions that range from the routine to the strange. The Jefferson Memorial—when it's not cherry blossom season, it's less crowded and more peaceful than other monuments on the Mall, and a great place to chill and enjoy a beautiful day. It's hard to identify one favorite item or collection in the Archives, but I have a soft spot for Record Unit 311, National Collection of Fine Arts, Office of the Director, Records, 1892-1960. This was one of the first collections I ever processed as an intern at the Archives, and it contains the earliest records of what is now the Smithsonian American Art Museum. The first Director was William Henry Holmes , a true renaissance man who was well regarded as both a scientist and watercolorist. He also had a great mustache. 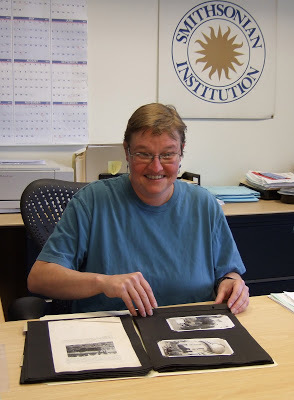 Smithsonian Institution Archives Director, Anne Van Camp, retires.